Notre Dame is a fun board game of card drafting, hand management, and more. You get to play with tiny wooden cubes, which is fun more often than not, and you get to fight off rats, which is fun much less often. Notre Dame is another one of those games where scoring points is most important. How you score points is up to you as there are several possibilities. You can gain points outright by collecting victory point chips. You can trade other items for them. You can pick them up in your carriage. You can even get them from the cathedral in the center of the board, but you might have to share if others have the same idea. One of the more interesting features of Notre Dame board game is how you get action cards to play. You start with three of your own cards, select one to keep, and pass the other two to the player on your left. You’ll get two cards from the player on your right. You keep one and pass the other. Then you decide which two of the three you now have you want to play this round. There’s plenty of guessing and second guessing to go around. Besides playing two cards from your hand each round, you can also pay a coin to hire a person (card) for extra actions. All of these cards help you get more playing cubes, or more victory point chips, or move items around so you can put them to better use. I mentioned that this game involves rats. Each round, a random number of rats invades your section of the city. If you’re not prepared to fend them off, you’ll lose a fair portion of what you’ve gained. And while losing once to the rats isn’t a sure sign of defeat, losing more than once likely means you won’t win the game. After nine rounds of play, hopefully you’ve used your cubes and coins wisely and turned them into more victory points than your opponents. If you have, you win. Notre Dame has a uniquely shaped board that accommodates 3, 4, or 5 players. With 3 players, the central cathedral piece is a triangle. With 4, it’s a square. With 5, it’s a pentagon. The components of the game – cards, cubes, carriages, coins, and so on – are all good quality and should last a long time. There is plenty of variety in the game because of how the elements are semi-randomly implemented. You’d have to play it hundreds of times before you might feel like it’s the same game you played earlier. 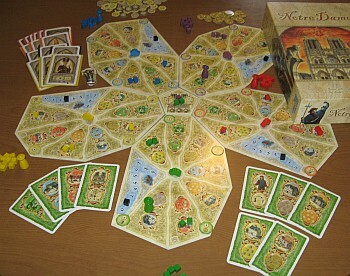 Notre Dame is an enjoyable game with some mechanics, like the card drafting, that are found in few other games. The rules are easy enough for children to learn and to play well. You should have little trouble finding several people who love to play it with you. 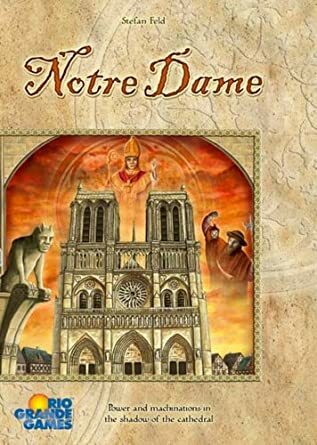 If you’ve played Notre Dame board game, please leave a rating and comments using the link below.